So much for the LEFT’s claims that only “Hitler” signs show up at Tea Party rallies. Look what popped up at this weekends “Bring in the Clowns” non-political rally in DC. From MSNBCcomes the following Hitler sign from the moonbat LEFT present at this weekends Jon Steward “sanity” insanity rally. The rally was supposed to embody working together, so much for that. We can see that the LEFT has put Hitler mustaches on pics of the likes of Sarah Palin, Glenn Beck and Republican Reps John Boehner and Eric Cantor. 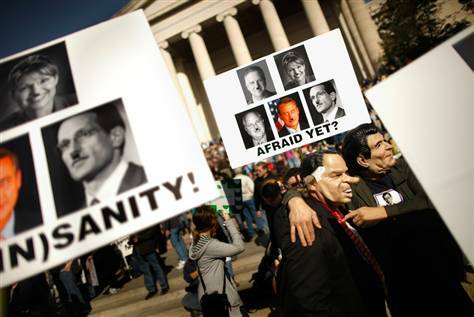 Just an FYI … Eric Cantor is a Jew, how absolutely sick and disgusting is this from the LEFT? Just another thing you will never see on the MSM. Oh and by the way, 215,000 people … REALLY! REALLY? Hardly. 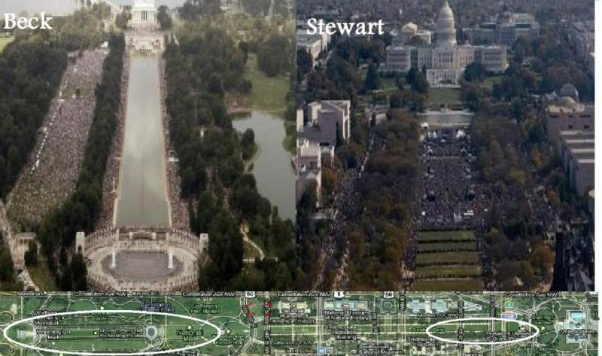 Let’s take a look at Patterico Pontification’s pic of the Stewart and Beck events. You make the call. Just ask the Resident Libtard & Dried up Old Prune of Day Time Television Viewing and Talk Show Host, Joy Blowhard about HITLER, and her public rants about the Nazi regime. Seems to me that Extreme Right Kool-Aide Drinking Delusional Fugly B*atch (such as) Joy herself would be an expert at these types of matters. Believe she has had much to say along those lines as well. Too bad about the Hitler statements/etc. Anyone who watches Stewart can attest to the fact that he specifically told that kind of mentality to stay home. Look I have no authority or sense of the size of a crowd. But, the photo you are using is from early in the day before the rally started and thats simply disingenuous. Second, the rallies were in different parts of the mall with different widths.